In line with the retro character, the Classic features metal-encased telescopic forks that lead to a chrome crowned headlight. The instrument cluster is an analogue single-pod unit with a speedometer and an odometer. There is no fuel gauge but what you get is a low fuel warning light. Circular chrome mirrors also enhance the retro appeal. The switc hgear offered comes with all the basics. The Classic's fuel tank comes with an old-fashioned chrome tank cap and black rubber-finished knee pads that offer it the age old touch. Riding saddle is spring mounted and enhances the overall retro appeal. The Classic also gets an uncluttered rear section with smooth flowing mudguard leading to the tail-light. 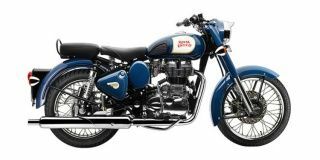 Spoked, chrome wheels further highlight this Royal Enfield’s Classic styling. The overall quality and finish are slightly improved but still isn’t at par with most modern Indian motorcycles.